Communities need to be fully accessible and at Scope we believe Communication Access is key to making it happen. This week is Speech Pathology Week (19-25 August) and the theme is Communication access is communication for all. We communicate to express who we are and make personal choices, and people with communication disabilities are no exception. Communication is a basic human right. Working with Scope for over 40 years, Hilary Johnson is a respected member of the speech pathology community and a renowned researcher. She’s dedicated her career to advocating for people with disability and complex communication needs, representing their human rights, developing communication potential and, maximising their quality of life. 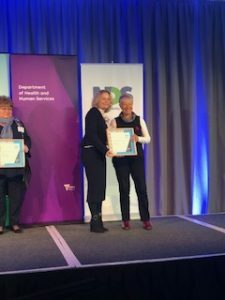 Hilary was recently recognised on the Victorian Disability Awards’ Lifetime Achievement honour roll for her significant contribution to the rights, participation and inclusion of Victorians with disability. Hilary plays a key role in Scope’s Communication and Inclusion Resource Centre (CIRC), a team committed to increasing awareness of communication difficulties and improving the capacity of organisations and people with communication disabilities to develop and participate in inclusive communities. To celebrate Speech Pathology Week, we asked Hilary to give us a glimpse into her life as a ‘speechie’. How long have you been involved in the disability sector and when did you start with Scope? I have worked with Scope for over 40 years. Prior to that I worked in a school for physical disability in the UK after graduating. Could you tell us a bit about your role with Scope? Currently I work in the research area, focusing on communication and assisting others develop and publish an evidence base in this area. What led you to becoming involved in speech pathology? I was good at public speaking at school and everyone thought I should become a teacher – everyone except me. A close friend of my mother’s was a physiotherapist, so I went to see some physios practice in a hospital. Through a young person’s eyes, it looked boring – classes of old people struggling to move! And then someone suggested speech therapy; I was hooked in just one group session. What do you enjoy most about your career in speech pathology? Is there an area of specific interest? The most exciting part is the people you meet. Working with communication means you really get to know people; what they like, how they feel, what they want in life. It’s a unique and privileged perspective. The best thing about working in developmental disability is you get to see people you worked with as a child grow to adults and you learn so much. What is AAC and why is it so important? Augmentative and alternative communication is any way to communicate that is other than speech. For instance, it might be by pointing to pictures, using key word signs, or using a voice output aid. Communication is a human right – without communication a person has no ability to exercise choice and control. What are some of the most remarkable changes have you seen in speech pathology over the years? The professionalism has greatly increased as the evidence for our work increases. Also, the technological changes are particularly striking in AAC with low cost technology allowing almost anyone to have a voice and be heard. If you’re working with a speech pathologist who is just starting out, what are some of the things you’d tell him or her? Consult the literature and find a mentor. Look for individualised solutions – beware one size does not fit all! Plan to incorporate goals your clients want to achieve, not only what you think they need. Oh so many! Never give up (Rome was not built in a day). Sometimes your ideas are ahead of others or the timing is not right for it to happen – just keep going. Another key piece of advice was to remember to build and take your team on a journey, as each of you will support the other when you are flagging. When thinking of goals, build on what you have started, rather starting an entirely new project each time. This will build quality and depth. And finally – before you go to meet a minister, take a deep breath and comb your hair! You’ve achieved a great deal in your career so far. What are you most proud of? I’m most proud of the CIRC team and meeting the fabulous leaders of tomorrow. Scope proudly launched the #AskForChange campaign at the 2018 International Society for Alternative and Augmentative Communication (ISAAC) conference, asking Australian businesses to do more to include customers with disabilities. We’re asking Australian businesses to lead the way in making sure everyone feels valued and can get their message across, regardless of how they communicate.